Until recently, it was understood that the addition of the prosthetic group lipoate is essential to the activity of critical mitochondrial catabolic enzymes; however, its regulation was unknown. In their paper “Poldip2 is an oxygen-sensitive protein that controls PDH and αKGDH lipoylation and activation to support metabolic adaptation in hypoxia and cancer“, Paredes et al. prove that the Poldip2-controled lipoylation of αKDH and PDH is regulated under hypoxia and in cancer cells, most notably in triple negative breast cancer cells (TNBC). Using a Don Whitley Scientific H35 Hypoxystation to establish accurate hypoxic environments, the authors were able to manipulate Poldip2 expression, allowing them to make substantial contributions to the understanding of Poldip2’s essential role in metabolic function during both normoxic and hypoxic conditions. Additionally, they postulate that Poldip2 deficiency may specifically impact the fate and availability of Ac-CoA due to impaired TCA cycle function, potentially providing cancer cells with an advantage for cell proliferation or hypertrophy. Further research will require investigating the interplay between Poldip2 and HIF-1α as well as the regulation of Poldip2 expression at different oxygen concentrations – a task easily achievable thanks to the Hypoxystation’s intuitive interface for effortlessly adjusting the gas composition. The Whitley Hypoxystation provides the user with incredible flexibility as it can control oxygen down to 0.1% while providing a temperature and humidity controlled environment with ample working space. The atmosphere is constantly monitored and adjusted by the real-time feedback system to ensure accuracy. Author: Felipe Paredes et al. In this paper, the authors show that poldip2 governs the critical mechanism linking clp, ACSM1, and protein lipoylation; thus, regulating mitochondria function. Lipoylation of two key enzymes in the TCA cycle, PDH and αKGDH, is a dynamically regulated process that is inhibited under hypoxia and in cancer cells, resulting in restricted mitochondria function. Poldip2, a ubiquitously expressed protein, regulates the lipoylation of both pyruvate and αKDH subunits via regulation of the clp-protease complex (CLPX ) and deregulation of the lipoate-activating enzyme required for lipoylation in mammalian cells, Ac-CoA synthetase (ACSM1). In Poldip2-defficient cells, repressed mitochondria function induces the stabilization of HIF-1α, thereby reprogramming cellular metabolism to resemble hypoxic/cancer cell adaption. Additionally, Poldip2 is down-regulated in hypoxic environments, further stabilizing HIF-1α while also inducing the expression of PDH kinase (PDK), consequently inhibiting lipoylation. 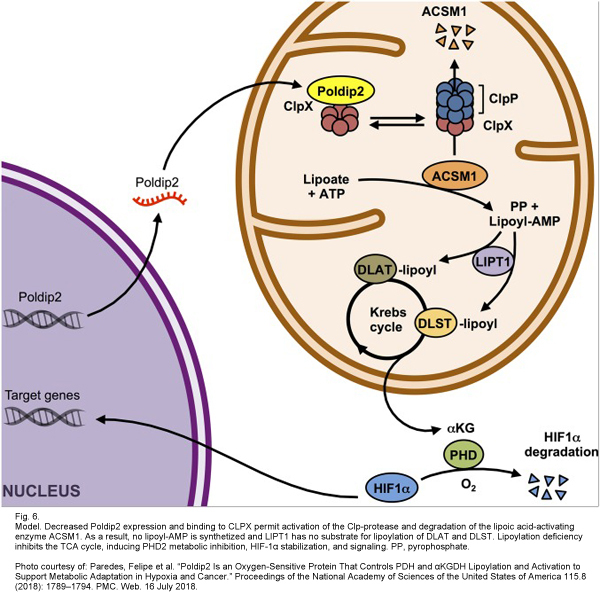 Poldip2 specifically binds to CLPX and sequesters it in normal cells; therefore, in poldip2-defficient cells, CLPX is capable of degrading ACSM1, impairing the lipoylation of PDH & αKGDH, limiting mitochondrial function, and stabilizing HIF-1α. This cascade was recapitulated in vitro by using the HypOxystation H35 to simulate a hypoxic environment so that the expression of poldip2 under oxygen tension could be analyzed. It was found that poldip2 was dramatically repressed under hypoxic conditions in a variety of cells. Additionally, it was proved that hypoxic conditions produced significantly reduced amounts of ASCM1 protein. Interestingly, forced ACSM1 expression in poldip2-defficient cells was sufficient to rescue lipoylation levels and slow cancer growth rates, proving that the loss of ACSM1 is the primary mechanism by which poldip2-defficient cells inhibit mitochondrial function. Implications of the aforementioned mechanism were analyzed in a cancer model. Impaired mitochondrial function and increased glycolysis create an advantageous environment for cancer cells to proliferate, survive, and become invasive in. It was hypothesized that cancer cells that express a highly glycolytic phenotype (OCR/ECAR = 2-5 pmol/mpH) are most likely poldip2-defficient. A specific sub-category of breast cancer known as triple negative breast cancer cells (TNBC) are known to be highly glycolytic, so the authors investigated whether poldip2-defficiency was involved. TNBC cell lines MDA-MB-231 and BT549 were found to have significantly lower poldip2 amounts compared to the non-TNBC cell line T47D. Again, a HypOxystation H35 was used to establish an accurate and reproducible hypoxic environment when analyzing the various cell lines. Poldip2-defficiency is speculated to specifically impact the fate and availability of Ac-CoA. Since the TCA cycle is inhibited in poldip2-defficient cells, Ac-CoA could be redirected to biosynthetic pathways which may represent an advantage for cell proliferation or hypertrophy in tumor environments. This article was provided by HypOxygen, Don Whitley Scientific’s North American Distributor.